Looping is something we’re all familiar with by now. It’s no surprise these devices are so popular – they let you single-handedly build up layer upon layer of music that is good enough to fill – in the case of Ed Sheeran – Wembley Stadium. With a microphone and a guitar (or some other instrument) and a bit of imagination, you can build up some epic sounding compositions. In this article, we’re going to walk you through the best vocal looper pedals on the market, and guide you through which are the best for you needs (and believe me, there’s quite a few available). 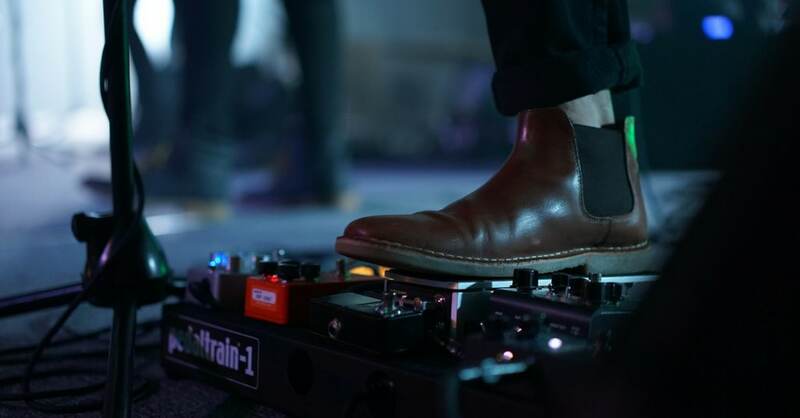 What is a Vocal Looper Pedal? As opposed to guitar focused looper pedals, these are pedals designed specifically for vocal loops. You may have come across ‘normal’ looper pedals you use on guitars and wonder why you couldn’t just use one them? Well, most of these type won’t include a microphone XLR input. Products that are dedicated to vocal always have an XLR input for mics, and the better ones have phantom power. Let’s look at the three things to bear in mind when shopping for one of these devices. The more important consideration is what type of looper should you buy. The three types are stompbox style (the ones you control with your feet), tabletop ones (which you control with your hands) and microphone clip-on ones, which are hand controlled as well. If you’re a singer who plays the guitar, you’ll want a stompbox-style product. 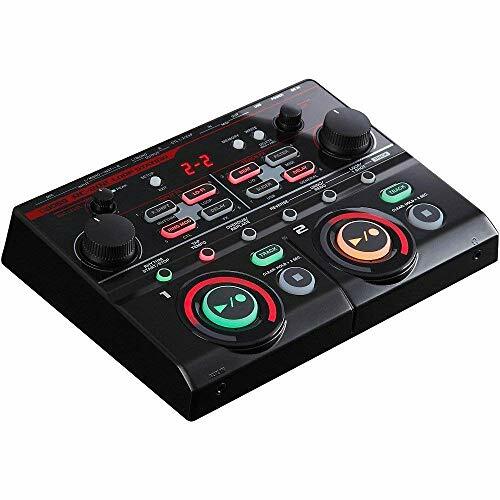 If you’re an electro musician and use midi controllers instead of real instruments, then a tabletop unit will be the best bet. Finally, if you sing and only sing, then one that clips to a microphone stand is the best choice. We feature all three types in our product reviews below. A vital feature is how much audio the product can store. Looping entails recording and overdubbing over and over again (layering) until you get the desired sound. Each product has its own limit of how long you can do this for, the cheaper ones, of course, having less time than the more expensive ones. Another feature to look out for is whether it keeps the track you’ve just recorded when you turn it off. Or whether there are any memory slots, you can save them on. ‘Tone suckage,’ or the phenomenon of each additional pedal in your chain negatively affecting your sound is a pain in the backside for many musicians. Of course, the pedals you add to your rig, the more you’re going to encounter it. Look out for what’s called true bypass which effectively shuts off the effect when it’s not in use. Many of the items we review in this article have built-in effects, which help to keep the level of tone suckage to a minimum. Some vocal looping devices offer additional functions like harmonizers, reverb and sometimes even auto-tune. If that appeals to you, go for it. However, some offer more looping possibilities, without the additional effects. If you want to really get into looping, you’ll want to look for something that has more than one ‘patch’, and the ability to save your loops. There are also straightforward options – some just loop. Then forget everything once you switch them off. This option will suit those who are new to looping or who want something simple. Now you’ve got an idea of which type is right for you, here are our top products in some more detail. 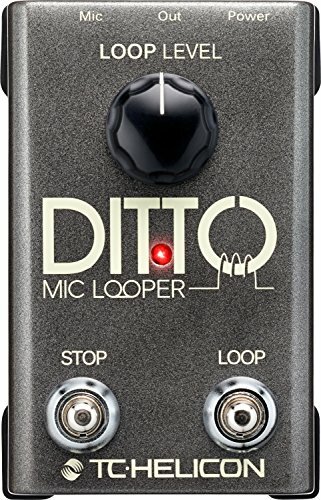 If you’re looking for a looper and nothing else, the Ditto Mic from TC Helicon is one to consider. It’s designed for a microphone input only (via an XLR input) and comes with no other effects other than a simple looping function. 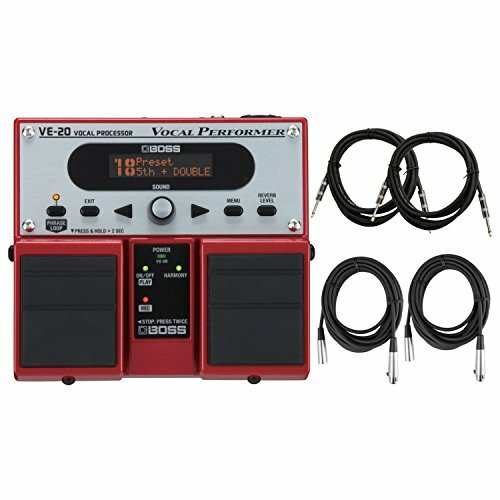 As you’ll see, many of the products here have vocal effects included – but this one only focuses on doing one thing well. On the technical front, it has one looping slot of five minutes with unlimited overdubs. Depending on how you see it, five minutes is either ample time or woefully short, that depends on how you plan to use it. It’s standout features are it’s two footswitches: one to start and stop the loop, the other to add your overdubs which keeps things simple. One volume know controls your loop level, and automatic mic gain control means you don’t need to mess about with multiple gain stages – it does it automatically. You can also control it via an MP75 of EA 35 effects mic, which is an excellent option. It’s very compact too, so won’t take a load of space in your gig bag or pedalboard, and it’s in a sturdy metal casing so will take a beating. It also stores your loop, even when it’s turned off, which is handy. Though it lacks additional features and can’t store your loops, it’s great fun and an easy to use introductory model. If you already own vocal effects pedals, then it makes a lot of sense; however, if you don’t own any effects units, then you might want to consider other products that include processors (or consider another pedal like the TC Mic Mechanic in combination with it). The VE-20 is a vocal effects processor, and looper rolled into one which is reflected in the price (considerably more than the Ditto Mic we reviewed above) and comes packed with a load of extras. As well as a ton of vocal effects, the onboard looper has a couple of functions worth mentioning. The ‘perform’ setting is a regular looper and works much the same as the Ditto (it lets you overdub as the loop goes round). The Check setting is quite clever in that it lets you record a bit of audio (recorded dry without any effects) that you can then use to cycle through the presets. It’s a great way to find a suitable effect. 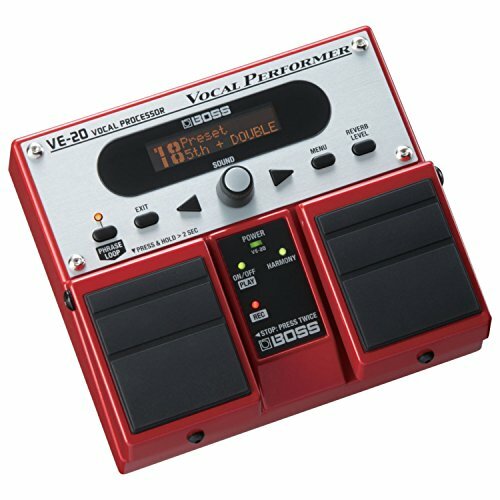 The Boss VE-20 is an excellent choice for someone with a bit more budget at their disposal, who is looking for effects as well. It’s excellent value for money. There are an array of effects and other functions to play with here. Can be run off a 9V battery or an AC adapter – making it highly portable. Sturdy, quite small and easy to use. Lacks some of the more advanced looping options you find on more advanced models. Holding down and double pressing the pedal in time takes a bit of getting used to. The Jamman Express XT is a similar price point and spec to the Ditto Mic, with a couple of extra twists that may or may not interest you. Like the Ditto, it’s a simple, stereo ‘one slot’ model with a single volume knob, but with twice the length of looper space (ten minutes, versus the Ditto’s five). Also, you can daisy chain or hook up multiple Express XTs to form a multi-looper (each unit will automatically sync up with one another). I’m not entirely sold on the benefits of doing this, but it’s a nice option if a bandmate had one of these and you wanted to join forces. The second feature that sets it apart from the Ditto is called ‘silent clear,’ which is a handy feature that lets you clear an overdub without the click of the footswitch infiltrating the sound (your loop starts on the ‘up’ of the footswitch, rather than the down). If you’re new to these pedals and need an introductory unit, or you want something super simple, then it will do the job nicely. 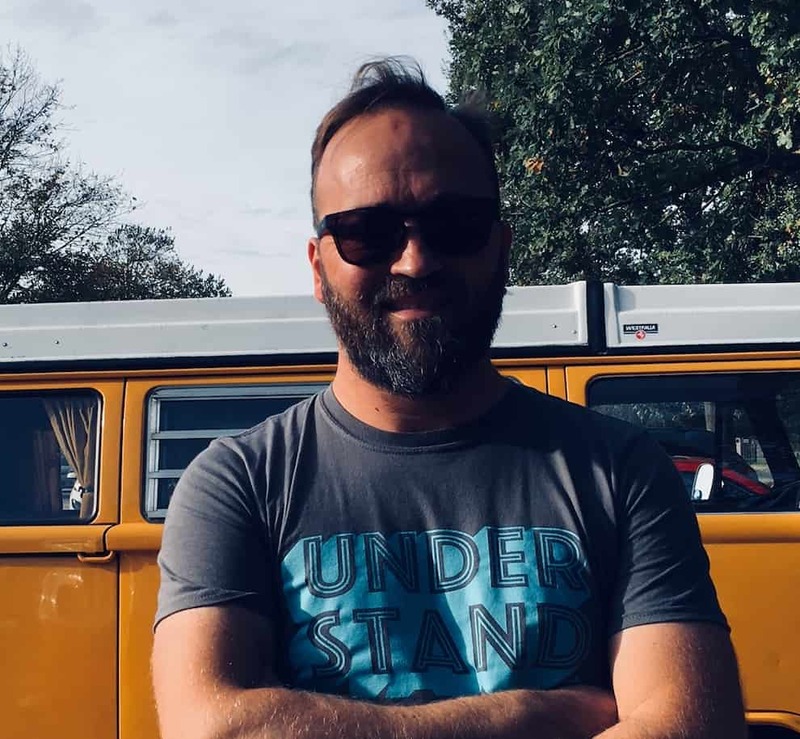 If you’re the type of person who quickly outgrows things, you may be better off considering a more feature-rich unit. Talking of feature-rich products, next in line we have the Boss RC-202 (a tabletop unit that’s a smaller version of their RC-505), features two loopers which give you the option of creating bespoke loops that you can add and remove as required. This makes the whole creative experience a lot more interesting, as you can store ready-made loops and bring them in for the chorus or any part of the track. It takes mics via two XLR inputs (one per channel) and includes phantom power which is super handy too. You get some very cool effects also, plus the LED visuals of the loops going round are a great visual feature. The one downside is that it’s not a stompbox and is designed to sit on a desk and be controlled by your hands, not your feet. You can use an extension control pedal at an extra cost. Probably overkill if you’re just looking for simplicity, but it’s great if you want something to get stuck into. You could use it for vocal and guitar, but you’ll need to be relatively tech-savvy to use its rich suite of effects. Want the best of the best? 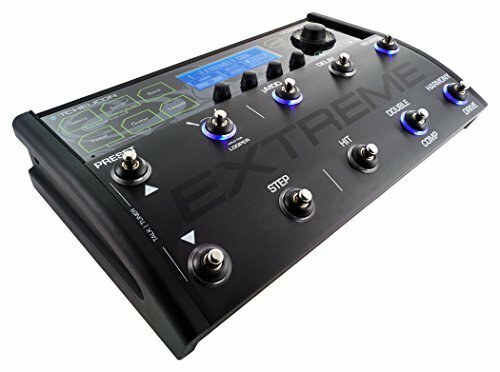 Then check out the Voicelive 3 Extreme from TC-Helicon. At a price that will make you want to hit the back button, this is a studio-grade vocal and guitar processor with a three-stage built-in looper. With a large forty-five minute looping time, you could record an album on this bad boy. It’s dedicated onboard three phase looper lets you create sections of a song on the fly (bridge, pre-chorus, etc.). Some of the extreme voices you can produce are worth the ticket price alone (check out the Barry White voice in the video below). 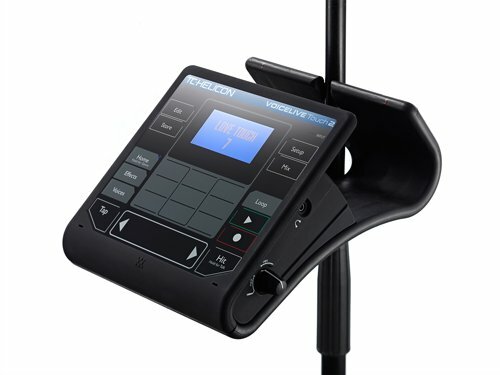 The only product on our list that clips onto the mic stand, the VoiceLive Touch is a powerful processor, and looper rolled into one. This highly modern device enables you to add vocal harmonies, delays, reverb and more, and its looping function is pretty good. As with many of these multi-functional pedals, the looper itself is a little limited. But if that’s what you’re after, combined with ease of use and a performance-friendly design, this pedal is sure to delight you and your audiences. Clips on to a mic stand, making it practical for performance. There are a lot of other functions as well. The touch-screen might not suit those who prefer buttons. You’ll need to get the associated footswitch to loop effectively and with ease. If you’re looking for a simple stompbox vocal looper and you’re aren’t bothered about effects, the Ditto Mic or the Jam Man Express XT are your first ports of call. 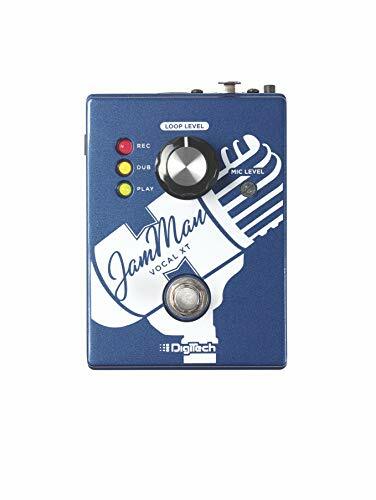 In terms of functionality, the Jam Man slightly edges ahead thanks to it’s silent clear and daisy chaining features, but the Ditto’s dual footswitches are arguably a more useful feature anyway. For a stompbox with effects, the Boss VE-20 takes the prize; it’s the perfect blend of functionality and value for money. The premium stompbox on the list is the TC-Helicon VoiceLive 3 Extreme – a fantastic bit of gadgetry which will leave a dent in the wallet, but if money is no object, then you could do a lot worse than picking up one of these. For non-stompbox options, the Boss RC-202 is a great tabletop model with a stack of cool features and more manageable than it’s sibling the RC-505 which has five channels (slight overkill I think). If you’re a singer and only going to be using it for that purpose, the TC-Helicon VoiceLive Touch​ is the best option thanks to it clipping neatly onto the microphone stand.